Cynthia Ann BEANE was born in New Albany, Floyd Co., IN. She was the daughter of 2. Walter Maxwell BEANE and 3. Lois Velleda DREHER. She married Johnnie Lee HENRY in Covington, Alleghany Co., VA, son of Joseph Wright HENRY and Betty Louise Rotge. He was born on 11 Jun 1949 in San Antonio, Bexar Co, TX. Walter Maxwell BEANE was born in Waiteville, Monroe County, WV. He was the son of 4. John Monroe BEAN and 5. Mary Elizabeth FAUDREE. He married Lois Velleda DREHER in Presidio of San Francisco, San Francisco, CA. Lois Velleda DREHER was born in Georgetown, FLoyd Co., IN. She was the daughterof 6. Henry Condar DREHER Jr. and 7. Irene Caroline BANET. PERKINS. 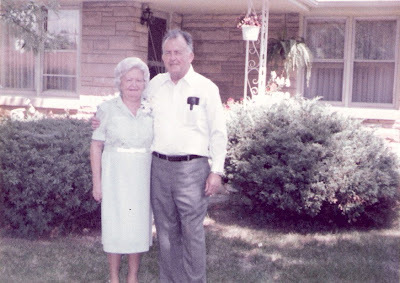 He married Mary Elizabeth Faudree 01 Dec 1935 in Covington, VA.
5. 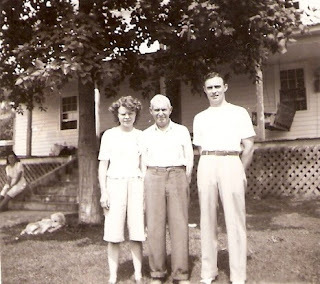 Mary Elizabeth FAUDREE was born on 03 Jun 1897 in Sweet Springs, Monroe, WV. She died on 01 Jan 1975 in Clifton Forge, Alleghany, VA. She was the daughter of 10. Stephen Ledford FAUDREE and 11. Elizabeth CARNIFAX. William McHarvey BEAN was born on 26 Aug 1832 in Dropping Lick, Near Zenith, Monroe Co, VA.
137. Mary MARSHALL. He married Elizabeth DAVIS in 1758 in Berks County, Pennsylvania. Jersey Settlement, Rowan, North Carolina. He was the son of 272. Thomas WISEMAN and 273. Elizabeth RENBERG. He married Mary MARSHALL in 1738. Germantown, Pennsylvania. He was the son of 544. Thomas WISEMAN Sr. and 545. Mary MURLON. 273. Elizabeth RENBERG was born 1675 in England. She died 1710 in Philadelphia, Pennsylvania. Thomas WISEMAN Sr. was born in 1645 in Wyndham, Norfolk, England. He was the son of 1088. Edmond WISEMAN and 1089. Unknown. He married Mary MURLON on 27 Jun 1670 in England. 545. Mary MURLON was born 1645 in South Wooten, Norfolk, England. Edmond WISEMAN was born in 1622 in Wyndham, Norfolk, England. He was the son of 2176. Robert WISEMAN and 2177. Jane COOKER. He married Unknown. My Grandpa Dreher was German, through and through. And as such, he was a real meat and potatoes kind of man! Meals tended to be heavy, as well as protein and carb intensive! Here's a dish that my Grandma Dreher used to make rather frequently for him. Preheat oven to 400-degrees farenheit. Use a 9-x-13 inch baking pan, and lightly grease. Place pork chops in bottom of pan, in a single layer. Cover with potato chunks. 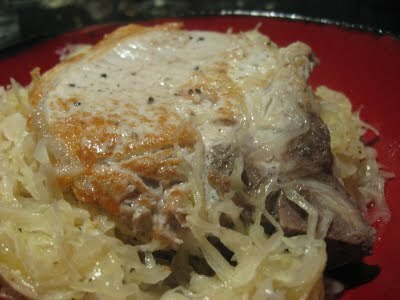 Then with drained saurkraut. Sprinkle brown sugar over all. Cover with aluminum foil and bake for 1-hour until meat is cooked thoroughly and potatoes are tender. This is served as a complete meal. Whenever this is cooking in my house today, I am instantly transported back to my childhood and those memories of Grandma and Grandpa's kitchen! The William Bean home in Waiteville, Monroe County, WV. Built abt. 1845. Martha Caroline Bean was born January 6, 1836 as the youngest child of William Bean and Rachel Wiseman Bean. 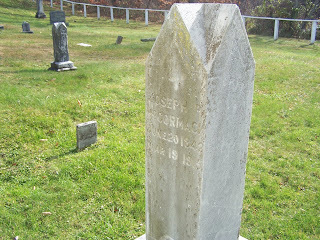 She married Joseph Preston McCormick [aka: McCormack] [1842-1915] on 08 Jan 1867 in Gap Mills, Monroe County, WV. It is unknown the cause of Martha's death. 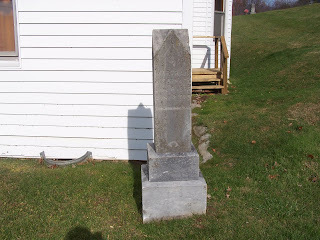 She is buried at the southeast corner of the New Zion Union Church in Waiteville, Monroe County, WV. Upon his death in 1915, Joseph was buried at her side. The couple share this same stone. Her name facing the southeast and his the northeast. 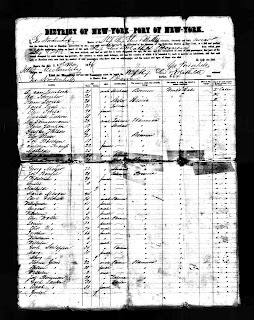 This rather odd looking death record, at first glance, looks more like an odd cash register receipt than a death record! But this was the first death record that we found regarding Joseph P. McCormick [aka: McCormack]. Return of Death to County Clerk. County Court. Penalty for non-compliance $10. Joseph P. McCormick [aka: McCormack] was born 20 Jun 1845 in Monroe County, [W] VA. His parents have not been determined at this time. 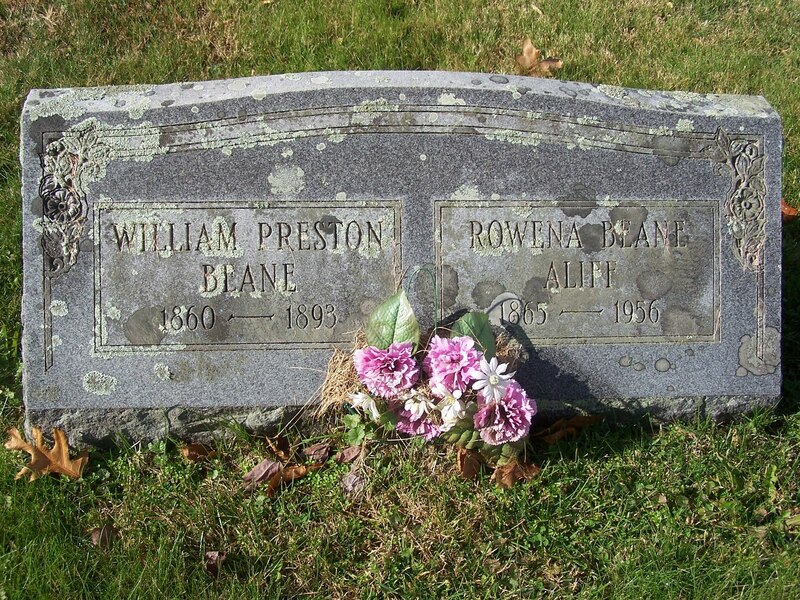 On 08 Jan 1867, he married Martha Caroline Bean [1836-1893], the daughter of William and Rachel [Wiseman] Bean; also born in Monroe County. After Martha Caroline's death in 1893, Joseph went on to marry Roena A. Porterfield in 1896, who was the widow of William Ballard Preston Bean [nephew of Martha Caroline]. Roena was born 1865 and died 1956. 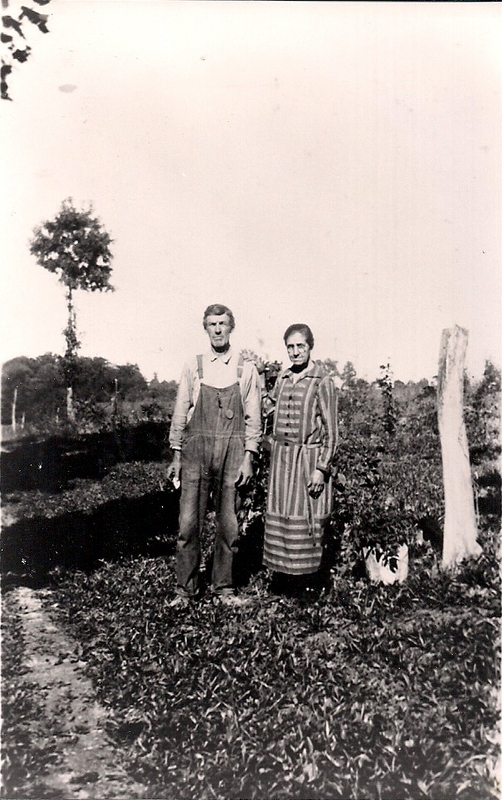 Joseph was a farmer in Waiteville, Monroe County. Upon his death in 1915, Joseph was layed to rest beside his first wife, Martha Caroline, at the southeast corner of the New Zion Union Church in Waiteville. They share a single obelisk headstone. Upon her death, in 1956, Roena was placed beside her first husband, William B.P. Bean, just a few feet away from Joseph and Martha Caroline. Eleanor Bean, her father John, and brother Bill. Week 17. Pets. Did you have any pets as a child? If so, what types and what were their names. Do you have pets now? Describe them as well. If you did not have pets, you can discuss those of neighbors or other family members. Tucked away in storage are my childhood photographs. Many, many of them are filled with snapshots of our family pets! My Daddy was a dog man. We ALWAYS had a dog!!! 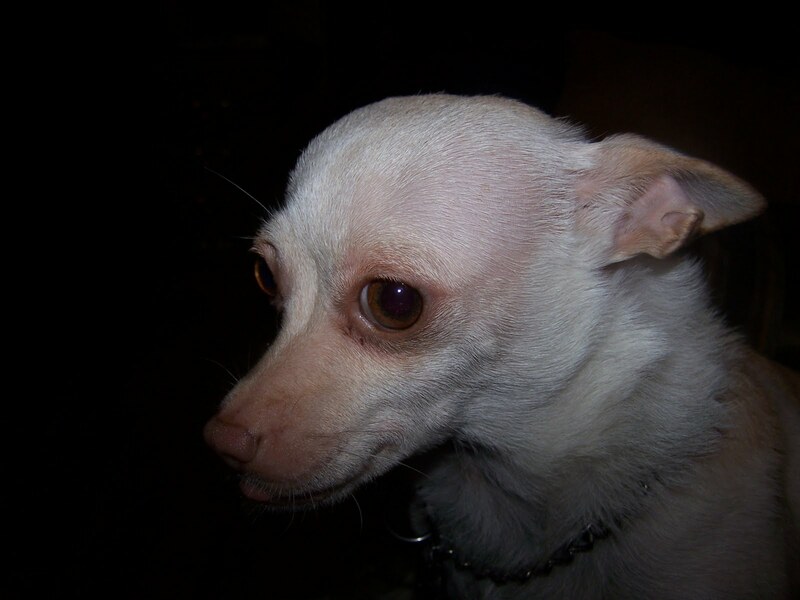 There was Freckles [a border collie], Flash, a German Shepherd mix, Sandy, a chihuahua, Angel, a purebred German Shepherd who was trained as a narcotics dog, Ughla, one of Angel's pups, Bimbo, an Alaskan husky. Then there was Fido, a Shetland pony! 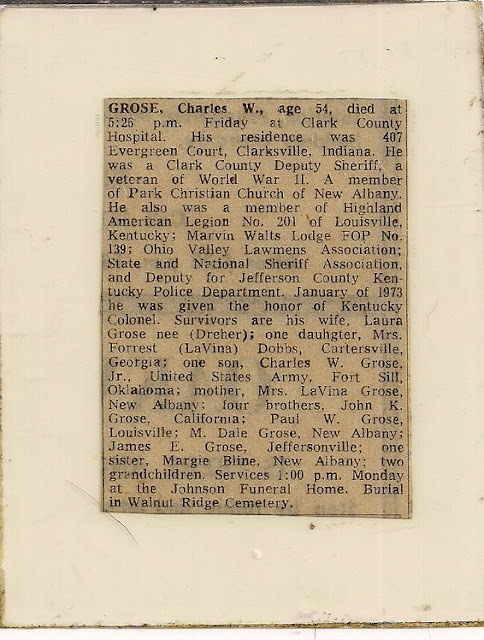 [Grandpa Dreher helped me to name him!] Grandpa said if he had a pony, he'd name him Fido so that the pony would think he was dog and follow him around like one. And Fido did just that!!! He thought he was a dog. He'd even sit on command! I had guinea pigs as well. [A male and female, and I named them Pint and Half-Pint.] Unfortunately, they were supposed to be two males, but when Mama came down one morning to find 22 squirming little guinea pig babies under Half-Pint, I was told the guinea pigs had to go!!! All 22 babies made it to "toddler" age, and we found homes for them, as well as Pint and Half-Pint. 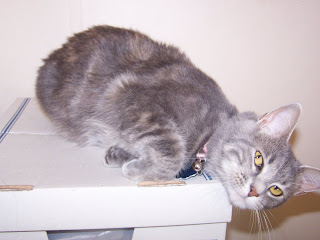 Almost all of our pets were rescued from animal shelters. I suppose the only ones that weren't were Angel and her pup, Ughla. I still have pets. A dog and a cat. They are also rescue animals. Here is Fred. Fred isn't male. Fred is a female. 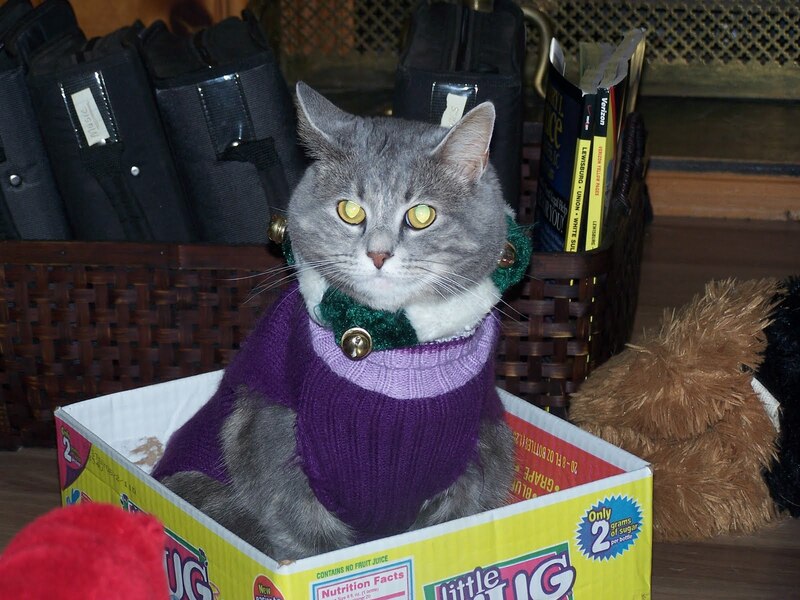 Texican named the cat, thinking he was getting a male, only to be fooled when it turned out to be a male instead! Fred is a whopper of a cat, weighing in at almost 20 pounds! But she is one of my babies!!! Chica is a Mama's doggy. She has never bitten me, although that doesn't mean she hasn't fussed [growled] and "back talked" to me! 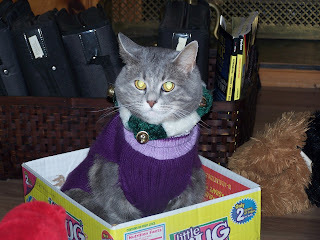 I pretty much let her run the house as she see fits, since she had such a horrible start in life! I want her to know she is loved and will never be abused again. You've seen those dogs on television who "talk"? Chica is one such doggy. When we got Chica, I was traveling on the road with my husband as he drove a big rig cross-country. Chica was not house broken, and I house broke her on the road! [She was such an easy doggy to house train!] I simply purchased the liver treats used by dog trainers everywhere. If she did her thing when we stopped, she got a treat. If she didn't, no treat! It wasn't too long before she got the idea! And in 9-months on the road, she only ever had 2 accidents!!! 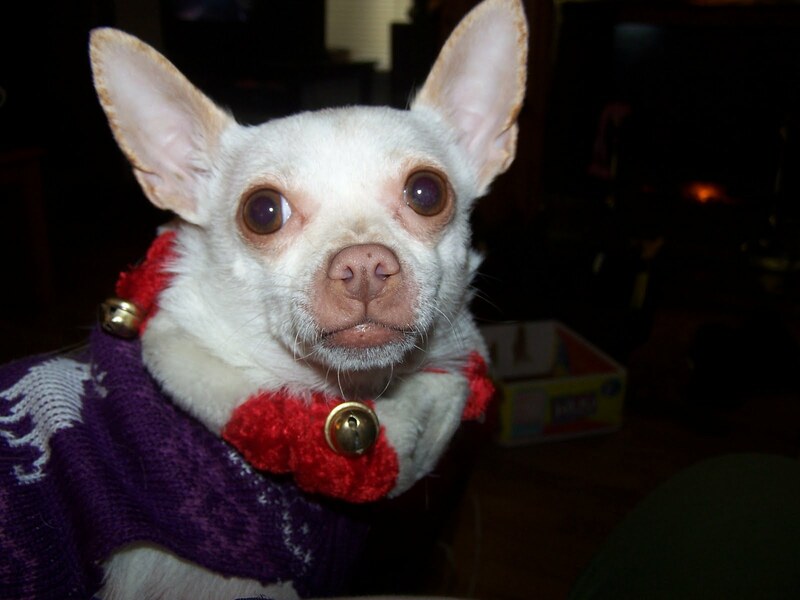 At Christmas I dress Chica and Fred up in costumes and take their pictures. As you can tell.... my pets are my pride and joy! Kind of like my grandkids. But that's for another post! Johnnie Lee HENRY was bornin San Antonio, Bexar Co, TX. He was the son of 2. Joseph Wright HENRY and 3. Betty Louise Rotge. He married Cynthia Ann BEANE in Covington, Alleghany Co., VA, daughter of Walter Maxwell BEANE and Lois Velleda DREHER. She was born in New Albany, Floyd Co., IN. 26. John W. SURBER and 27. Visa Ann SURBER. Texas. She was the daughter of 50. Antoine MARTIN and 51. Louise GUEDON. 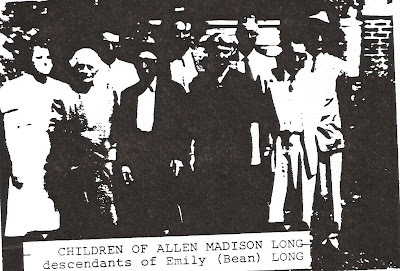 Audrey was the daughter of John Monroe Bean and Ada Burdette. Eloise was the sweet little daughter of John Monroe Bean and his [2nd] wife, Ada Burdette. Born Dorothy Eloise Bean, this little one was born into a home already suffering the loss John's first wife [Blanche], to tuberculosis, and the death of one son, Samuel Maxwell Bean [died 16 Dec 1923] to whooping cough just shortly after her birth. Her older sister, Pauline, was ravaged with tuberculosis. Pauline was enamored with her new baby sister, and the family did not appear to be aware that her closeness would indeed infect the child. Pauline was especially fond of cradling the baby and loving her she did so often. Pauline was 21 at the time of Eloise's birth. When little Eloise contracted tuberculosis, one can only imagine the heartbreak of her mother, Ada, but also of rapidly failing sister, Pauline, who so loved the child. Eloise died on Valentine's Day 1925. And Pauline lived but a short while longer, dying on 27 June that same year. John Monroe Bean was my grandmother, and this little angel was my aunt. 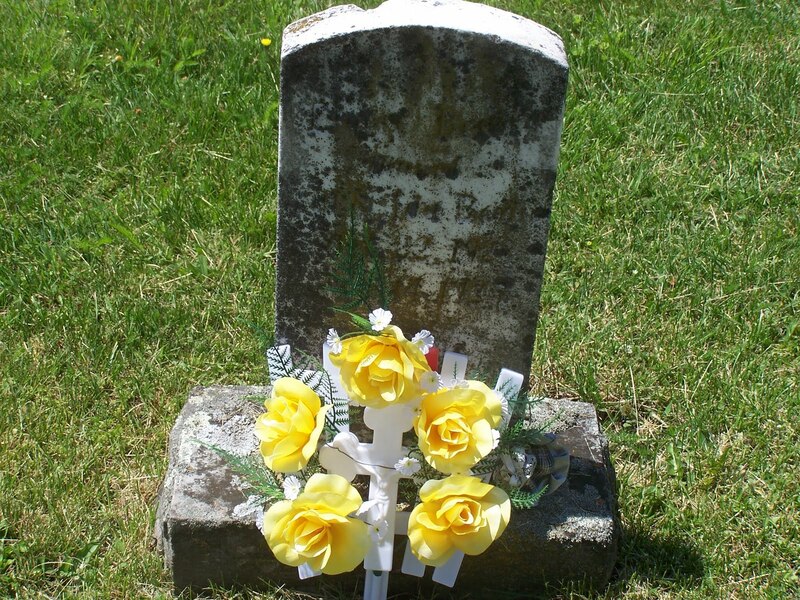 This is a Death Registry for Monroe County, [West] Virginia. The year is 1858 and this is page 14 and our subject of interest is found on line 11. Our subject's name is listed simply as William. Following the line across, we find that he is listed as S for slave.His "owner" is listed as William Bean. He is listed as a M [for Male] and the date of death is April 25th. The death occurred on Potts Creek. The cause of death is listed as bil fever [short for biliary fever, more commonly known as "yellow fever"]. His age is listed as 25 10 5 [25 years, 10 months and 5 days old]. His parents are listed as "Not Given". He was born in Monroe County, and his occupation is listed as Slave. His death was reported to the County Clerk by William Bean, whose relationship to the deceased is listed as Master. Family lore is that all slaves who died are buried on the perimeter of the family burial grounds, on Potts Creek in Monroe County. Week 16. Restaurants. What was your favorite local restaurant as a child? Where was it located, and what was your favorite meal? Did you know the staff personally? What is your favorite restaurant now? I didn't have to think very hard about this one!!! I grew up in the Naval seaport of Norfolk, Virginia [Dad was career Navy]. Some of my earliest memories are of eating seafood in the restaurants there! 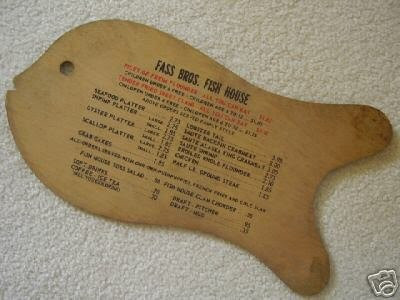 My favorite was one Fass Brother's Fish House, located at Sinclair Circle. Meals were served in family style fashion, with huge platters of food brought to your table! There was one addendum added on birthdays. Oh my! Nothing was as good as ending a meal with this delicious treat!!! And nobody did it as good as Shoney's!!! 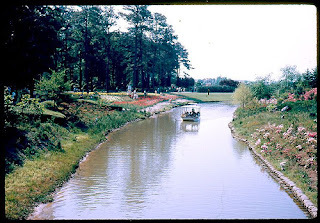 Alas, during my last visit to Norfolk.... Fass Brother's Fish House is no longer there. And even though I've tried from several different Shoney's restaurants to purchase the same delicious strawberry pie. [ad yes, I admit it's still good], it's simply not as good as the ones they had when I was a kid growing up! They simply don't compare! Well, I love our local Applebee's. I also enjoy a little restaurant near our home. 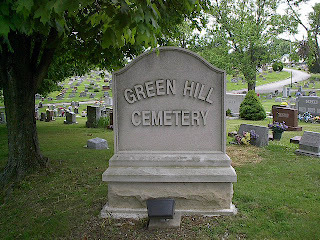 It's located at Hart's Run, just off the I-64 exit. Granny's Restaurant is a small place, with only seating for about 60-75 patrons at a time. They are open 7 days a week, and are open for breakfast, lunch and dinner. And the food is simply put, down-home cooking. [I've personally known some of the cooks over the years, and eaten at their homes!] Best yet... the prices can't be beat! You won't find a better bargain! If you're ever down our way... you've got to stop in. If you're not coming through at meal time, at least stop and have a piece of pie and cup of coffee!!! They make the best lemon meringue or coconut creme pie's in the world!!! What was your favorite restaurant when you were growing up? What is your favorite restaurant today??? 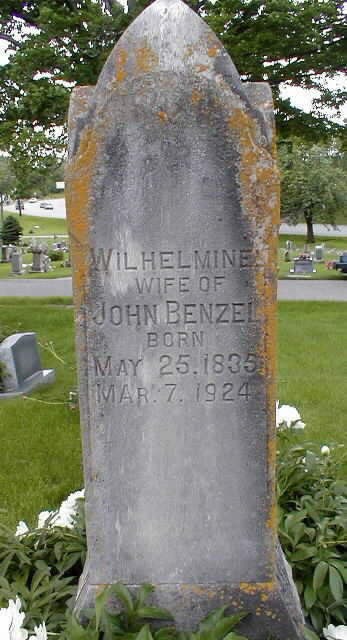 John [Johan] Benzel and his wife, Wilhelmine Lambrecht Benzel, were both born 1835 in Prussia. John was a master stonemason. They came to settle in Lawrence County, Indiana, where there was a plenteous supply of limestone quarried for his profession. They eventually went on to have 6 more children, including my great-grandmother, Josephine [1865-1932]. 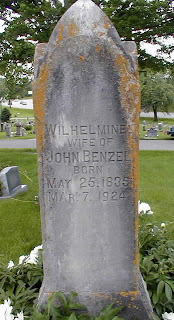 Wilehlmona Lambrecht Benzel was born in Prussia. We do not know her parents, or exactly where. She married John [Johan] Benzel while still in Prussia. 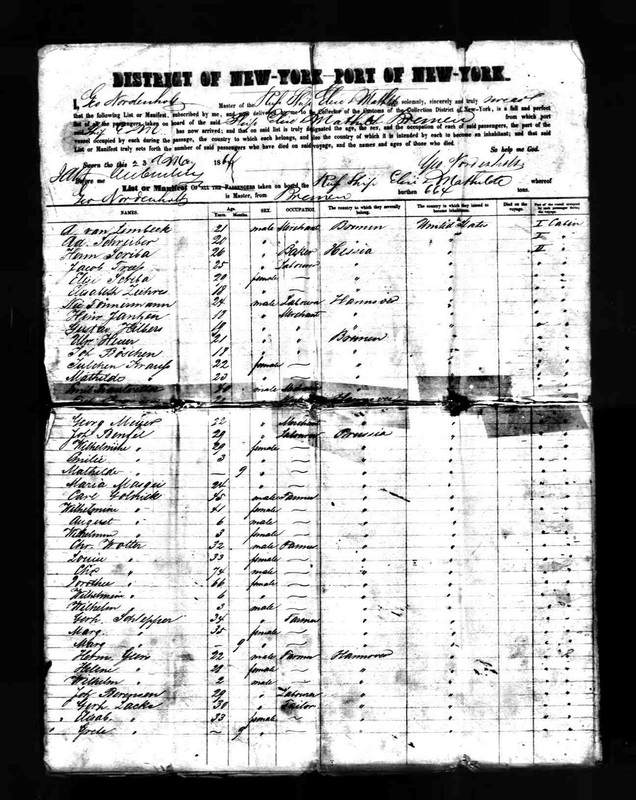 The immigrated to America, arriving in New York on 23 May 1864 with their two oldest children, Amelia [Emilie] and Matilda [Mathilda] who were 3 years and 9 months of age respectively. The couple went on to have six more children: Josephine, Minnie, Louis, John, August and William. 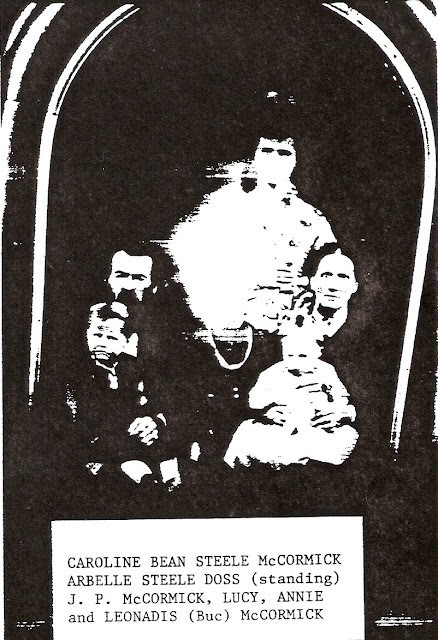 Wilhelmine is seated on the left, daughter Josephine is seated on the right, granddaughter Florence is standing at the rear, holding her daughter, Louise [abt. 1910]. It is said that the couple's tombstones were crafted by family members. John was a master stone mason and worked with the native limestone of Lawrence County. Wilhelmine's daughter, Josephine [1865-1932] was my maternal great-grandmother. Her son Henry was my grandfather. Week 14. Spring. What was spring like where and when you grew up? Describe not only the climate, but how the season influenced your activities, food choices, etc. This was certainly a favorite assignment of mine so far! My growing years were spent mainly in Norfolk, VA [the city by the sea!]. And we lived only a very short [few blocks] from the beautiful Azalea Gardens. When these gardens began blooming, we knew that Spring had officially "sprung"! 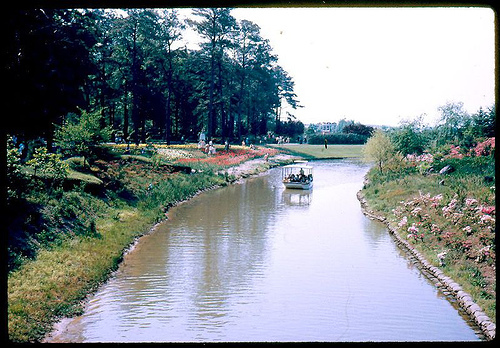 Canals were dug from the bay inlet to allow for canal tours on boats through these gardens! But it's the beautiful walking tours through the botanical gardens that one doesn't want to miss!!! Growing up, this was a yearly spring excursion for Mom, my sister and I! We would pack a picnic hamper with our lunch, walk through the gardens and then settle down for a picnic. Usually this consisted of Mama's fried chicken! And believe me... that was a treat! Spring always heralded the first picnic of the season, and that has always meant bringing in the new season with one of my favorites, potato salad! Yum! But as I have grown a bit more mature in my tastes, today the herald of spring comes with the first taste of freshly cut asparagus from Dad's asparagus beds! But not steamed, or boiled.... no, no! 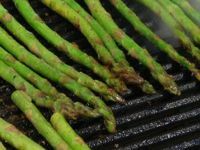 For it to truly represent spring, one must drizzle the stalks with olive oil, shake on a little sea salt, and these delectables must be cooked out of doors on the grill!!! Now that spells spring to me!!! 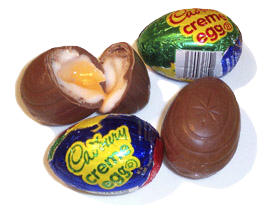 ...the arrival of Cadbury Creme Eggs in the stores!!! This hard working couple were my great-grandparents. Francis Isidore Banet [1863-1945] and Adeline Josephine "Della" Eve [1867-1958]. The couple were married 1893 in Floyd County, Indiana. And they had eight children. Among those children, was my grandmother, Irene Caroline [1906-1989]. Randy's offered us yet another bit of fun this Saturday evening!!! 1) Know that the 1940 United States Census will be released for public viewing on the National Archives website on Monday, 2 April 2012 (366 days from today!). My understanding is that, when it is first released, that there will be no indexes available - we will have to search them the "old way" - with known addresses, finding enumeration districts from maps and websites, and then go page-by-page to find our folks. Eventually, there will be indexes available, but we don't know how long after the release that will be. 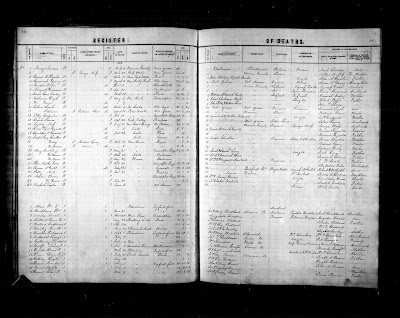 2) Which of your ancestral family members will be in the 1940 census? Consider not just your ancestors, but also their siblings. 3) Where did your ancestral family members live in 1940 on Census Day? Have you found all of the addresses in city directories or telephone books? Please list the ones you know the addresses of, and the ones you need to find addresses for. 4) Tell us about it in a blog post of your own, a comment to this blog post, or on a Facebook note or comment. 1. Unfortunately for most of my rural family in 1940, there won't be street addresses, and I will have to rely upon known farming neighbors in order to locate them! 3. Since neither of my parents homes had telephones in 1940, nor did their rural communities have directories, this really won't help me alot! Both families received their mail simply marked "General Delivery". It doesn't promise to be an easy task to look through those un-indexed census records! But it's one in which I am raring at the bit to get into!!! 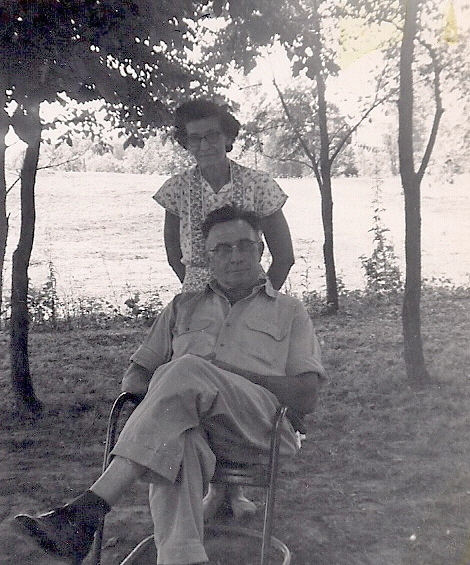 Today we take a look at my maternal grandmother's maternal line, the EVE family. Benzel. He married Irene Caroline BANET on 12 Dec 1923 in Indiana. Oct 1893 in Floyd County, Indiana. IN. He was the son of 60. Unknown Eve and 61. Unknown. He married Annette before 1858. 31. Joseph EVE was born on 11 Jan 1829 in France. 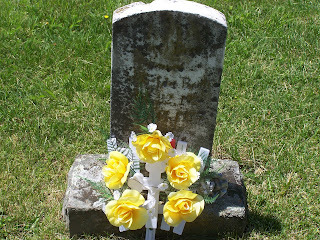 He died on 08 Jan 1892 in New Albany, Floyd Co.,Annette was born 12 Feb 1840 in Indiana. 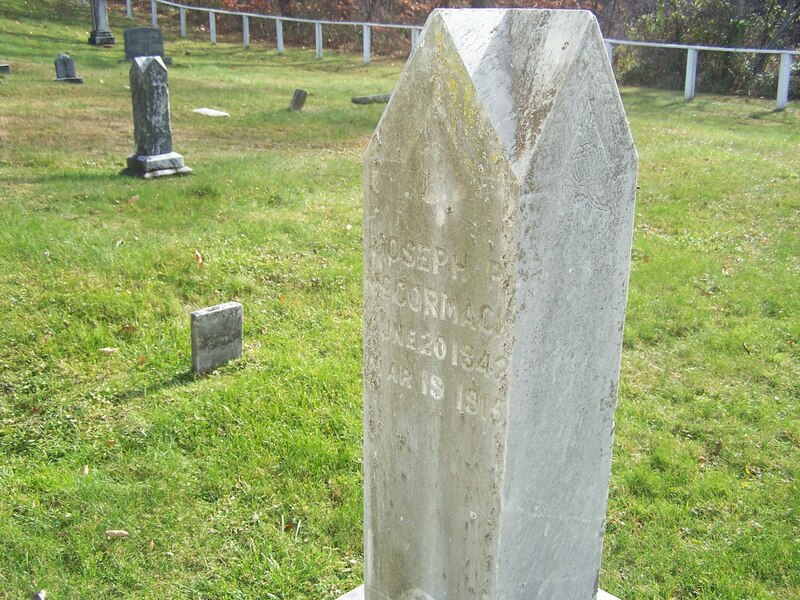 She died 01 May 1870 in Indiana.Francis Isidore Banet was born on 15 Aug 1863 in Indiana. He died in Apr 1945 in Indiana. He wasAdeline Josephine EVE was born 11 Feb 1867 in Indiana. She died 05 Nov 1958 in Indiana. SheHenry Condar DREHER Jr. was born on 31 Dec 1902 in Louisville, Jefferson, Kentucky. He died onIrene Caroline BANET was born 24 May 1906 in Indiana. She died 08 Aug 1989 in Gap Mills,Walter Maxwell BEANE was born in Waiteville, Monroe County, WV. He was the son of 4. John Monroe BEAN and 5. Mary Elizabeth FAUDREE. He married Lois Velleda DREHER in Presidio of San Francisco, San Francisco, CA.Lois Velleda DREHER was born in Georgetown, FLoyd Co., IN. She was the daughter of 6. Henry Condar DREHER Jr. and 7. 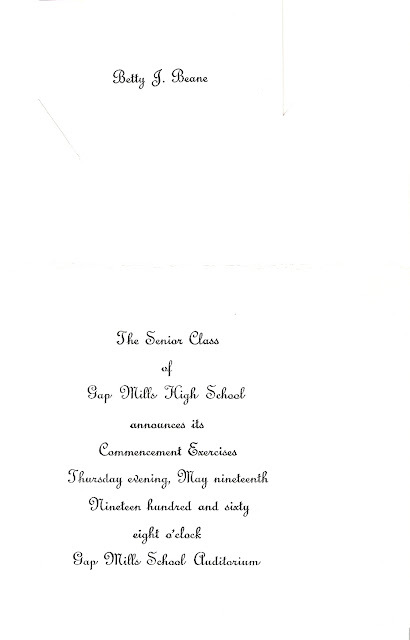 Irene Caroline BANET.Cynthia Ann BEANE was born in New Albany, Floyd Co., IN. She was the daughter of 2. Walter Maxwell BEANE and 3. Lois Velleda DREHER. She married Johnnie Lee HENRY in Covington, Alleghany Co., VA, son of Joseph Wright HENRY and Betty Louise Rotge. He was born in San Antonio, Bexar Co, TX. Margaret C. KINTZLEY WILLIAMS was born 27 Oct 1848 to Jacob Kintzley and hannah Price. She married Henry Bunyon Williams [probably around 1866-1867] in Craig County, Virginia. Margaret died 1922 in Virginia.